MASTER KEIGO ABE 8th Dan. Interview By Thomas A. Casale. BREATHING TECHNIQUES FOR MARTIAL ARTISTS. By Aaron Hoopes. 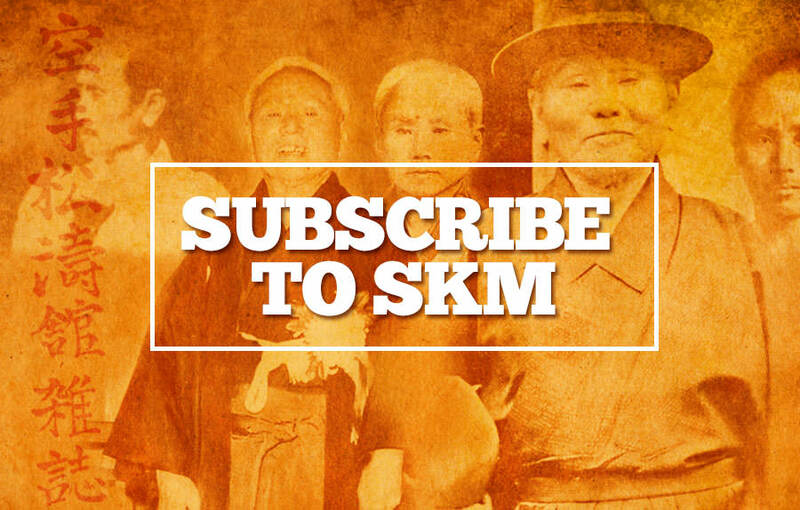 THE JKA: A HARD ACT TO FOLLOW. By Dave Hooper. THE NEW GENERATION INSTRUCTORS. Report By John Cheetham. THE BIOMECHANICAL RATIONALE of the SNAP-PUNCH. By Dr. Bill Laich. 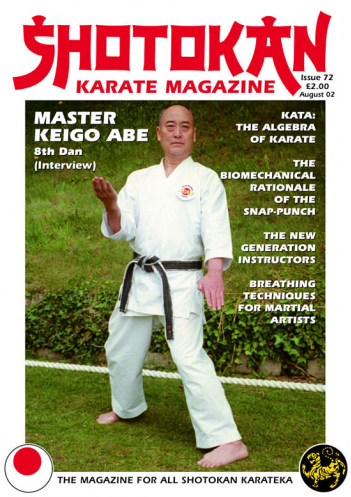 This edition features sensei Keigo Abe 8th Dan. Abe sensei is another former JKA instructor who left the organisation some years ago and now heads his own organisation, the J.S.K.A. (Japan Shotokan Karate Association). Abe sensei was Masao Kagawa's instructor at Teikyo university and also taught Yahara sensei, amongst others (who incidentally also heads his own organisation now). Sensei Abe has a very open-approach as you will see, although still deeply steeped in the traditions of Budo. Thanks to New York instructor, Tommy Casale and Richard Amos (now also based in New York) for this terrific interview with Abe sensei, who was here in England in May this year where he and Richard Amos conducted a very successful open weekend training course, organised and hosted by the FBSKU(I). In the last issue Hirokazu Kanazawa stated that if he had more time he would like to teach the various breathing techniques and methods in much more detail. In truth, rarely do we learn 'how' to breath correctly in any real depth in the course of normal training. All is revealed in Aaron Hoopes' 'how-to-do' article (explained in layman's terms). This is a very neglected subject and students of all levels will learn from this and for once it's not hard work! There seems to be a serious 'debate' going on at the moment in the 'Letters page' regarding the various merits of the karate 'snap-punch' as opposed to a 'thrust punch'. Of course, the old argument will spring up about ñ it's not the technique that counts, it's how good (effective) the person is who's throwing it? That's fair comment always, but if you look at it from the angle of; the same person performing two 'different methods' of delivering the 'same' technique, then there is some validity in this debate. A 'thrusting' action and a 'snapping' action are somewhat different, and some people will make more power one way and less the other or sometimes equal power both ways. Dr Bill Laich's article and 'letter' in this issue both offer an honest, scientific technical insight into this interesting topic. People talk about the future of Shotokan Karate, well, there are some amazing 'young' instructors coming through now, which is why I published, 'The New Generation Instructors' in this issue. What they are doing is explaining and demonstrating (teaching) techniques in far, far more detail than when I started in the early 1970's. This methodology not only makes you technically better but also (importantly) prevents unnecessary injuries through the use of correct biomechanics. I've focused on two young Shotokan instructors, Scott Langley (England) and Yasuhisa Inada (Japan). In Scott Langley's 'Kata' article, you'll learn something very interesting about Nijushiho and why/how the kata changed! We try very hard to strike a balance in the magazine with articles both technical, philosophical, historical and scientific and I think this balance is equally reflected in the diverse 'letters' we receive. Most important is that we try to have an open mind and realise that there are many different ways within the martial arts, but the underlying fundamental principles and values are the same! Osu!